Cyalume Military/Tactical Infrared Chemlight 6" Light Sticks are the gold standard in chemical light technology. These IR Chemlights are made for tactical military operators looking togain or maintain tactical advantages. There is nothing out there like it in the market today. There is a 3 hour and 8 hour version. They are the most reliable source of light in an emergency. They are safe and non-toxic with no batteries or flames involved. 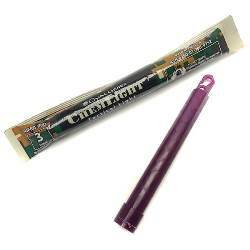 Cyalume light sticks have a shelf life of 4 years and are made in the USA. Per State Department regulations: when you order IR products, our team will follow up with a required form via email. Please complete and return the form so we can fulfill the transaction.